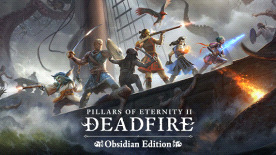 • Official Soundtrack: The soundtrack to Pillars of Eternity II: Deadfire by Justin Bell, featuring all-new tracks inspired by the peoples and factions of the Deadfire Archipelago. • Defiant Apparel: This stylish tricorn hat comes with a built-in eyepatch that protects the wearer from a variety of ocular incursions, as well as looking extremely piratical. • Cosmo, the Space Pig: It wouldn't be Pillars of Eternity without Cosmo! Cosmo accompanies your party, floating on cyan gossamer, inspiring you through a combination of unflappable courage and incredible cuteness. • Digital P&P Guide: Pillars of Eternity has a strong tradition of adapting and adopting pen-and-paper techniques in our systems and adventure designs. Our designers decided to take that knowledge and give something back to the tabletop community! This pen-and-paper adventuring system has been developed from the ground up by Pillars of Eternity II: Deadfire lead designer Josh Sawyer and other members of the Deadfire design team. Connect with other Deadfire fans and create your own adventures! • Hi-Res Digital Map: This handsome sea chart is suitable for use as a desktop wallpaper or can be printed to assist you with navigating the treacherous waters of the Deadfire Archipelago. • Digital Guidebook, Vol. II: Created by our friends at Dark Horse Comics, this is the next volume in the comprehensive guide to the world of Pillars of Eternity, filled with the legends, lore, and lost locations of the Deadfire Archipelago. Useful as an adventuring companion, or just to browse and learn more about the intricacies of this deep and enigmatic corner of Eora, the digital guidebook features beautiful illustrations and plenty of fascinating background.